Here are the latest Pottery Barn Paint colors for Spring. I like the medium tan/taupe called Cedar Key. The blue is also a popular color these days as is the chocolate brown. Learn more about the colors here at My Perfect Color here. So I finally feel confident to announce My Perfect Color's new spring colors. 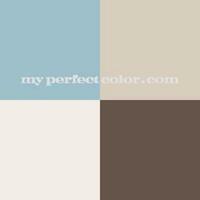 I especially like the one in the lower right corner - Benjamin Moore's Wythe Blue. Sophisticated, elegant, fashionable. Check out these and other colors at My Perfect Color. For years, Stainless Steel appliances has ruled as homeowners strived for a high-end, commercial look in their kitchens. While Stainless still rules, some concerns include how visible smudges and dings can be. (I can say with three kids, my refrigerator always looks smudged.) Another concern is that most home trends last about 10 years and stainless is getting close to that. So what's new. Unbelievably, people are talking about AVOCADO. Seriously. But the hot, new trend is oiled bronzed appliances. I must say it's a rich look. I don't know if it's life as a trend will be as long as stainless, but you heard it here first (maybe, probably) ... oiled bronze! Check this article out for more information. You are spot on...oil rubbed bronze is rich. I’m attaching a visual of a kitchen that features oil rubbed bronze appliances. The cabinetry is Fieldstone Cabinetry. We used the Concord door style in Maple finished in White with a Bronze glaze. And I’m glad wallpaper is back! Looking through wallpaper swatch books is relaxing, just like browsing fabrics is. Thanks for the fun newsletter. I look forward to it every week. Yellow is a popular, bright, versatile color. Sunny yellows, soft buttery hues, and rich golds are all popular now. But yellow can be a tricky color. The perfect shade can look glorious while the wrong tint becomes grotesque. (This is a color family where getting a small sample can of paint is a good idea.) If you're thinking yellow or gold and want some ideas, you've come to the right place. Take a look at this article and series of photos from Better Homes and Gardens. Check out the latest colors that designers have picked this month. I especially like the Concord Ivory and Wilmington Tan. See them here and then buy samples to try at your house. 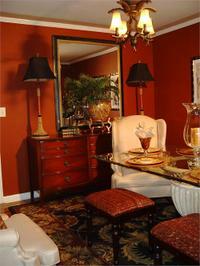 This is a classic color combination yet a difficult one to pull off in any but modern decors. I've seen in mentioned in many articles now so it must be a trend. Black and White. Either on it's own or as a counterbalance to another very strong color. Lines, geometric shapes, and even zebra stripes are all popular in this color scheme. Personally, I need to add a vivid color to the mix - a dash of deep red, a splash of flaming orange, a drop of royal purple, but something to relieve the starkness. 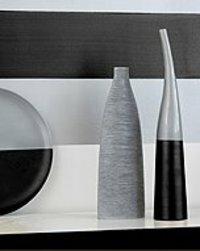 But if you're going for a sophisticated look in a modern decor, think black and white. Here's how to achieve a textured wall finish - more modern than wallpaper, easier than faux finishing. 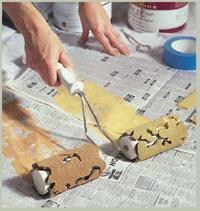 Use a decorative roller and paint as normal. Use a slightly different colored paint over a base coat. Or use a glaze. The key and secret is the decorative patterned roller. 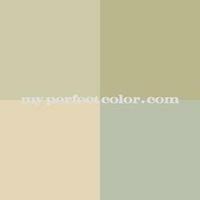 See this site for great instructions and color combinations. Beautiful and easy! Since the previous post was about accent colored walls, I thought we'd look at the latest color trends. What are designers looking at for 2008? Nothing really unexpected here other than there are so many hot colors. From green to blue with jewel tones thrown in too. Actually jewel tones seem to be the most consistent theme between these designers. Read six designer favorites here.